Ka-pow! . . . Patrons may browse these books next to the Paperback Collection, or search for individual titles in the Library Catalog: Collection Graphic Novels, 1st Floor. See a growing list here. And, for the uninitiated, we now present a primer on the world of sequential fiction/non-fiction . . .
Manga, Comics, or Graphic Novels? You may use the Japanese term manga interchangeably with the American term graphic novel. Manga is typically published in series, which may include many volumes to tell a complete story. A majority of English translations of manga carry over the original artwork, only replacing the words. Not necessarily. The themes in graphic novels can be highly sophisticated, portraying complex historical events and philosophical ideas. They also employ literary devices like allusion, satire, understatement, hyperbole, etc. . . .
Should I read a graphic novel or a regular one? Both are recommended! Each genre has its own unique qualities. The visual aspects of storytelling, including time and motion, story closure (the idea that a reader fills in unspoken blanks), and the psychology of line styles and color make graphic novels appealing as a hybrid format. Who drew the first graphic novel? Shrugs . . . maybe it was the Egyptians and their hieroglyphs? For information or to make title suggestions, please contact Librarian Josh Weber at joshua.weber@sunywcc.edu; x6819. Kraska, Jake. “The Psychology of Comic Books: Why We Worship Superheroes.” Lateral Magazine, 3 Aug. 2015. McCloud, Scott. Understanding Comics. William Morrow, 1994. Mitchell, W. J. T., de Almeida, Eduardo, and Reynolds, Rebecca. 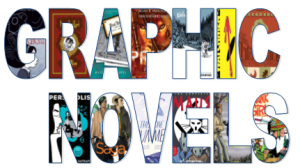 “Theories of Media Glossary: ‘Graphic Novel,‘” University of Chicago. Feb. 2004. Osicki, Jody. “Sequential Art Proliferates: Spotlight on Graphic Novels.” Library Journal, Library Journal , 19 June 2018. Thomas, Grant. “Thinking Inside the Boxes: The Importance of Comic Books and Graphic Novels in Visual Arts Education.” Visual Arts Research, vol. 38, no. 1, 2012, p. 64+. Academic OneFile.